The Wemo® WiFi Smart Dimmer, F7C059 controls different dimming levels of a dimmable light bulb, including switching it ON and OFF. 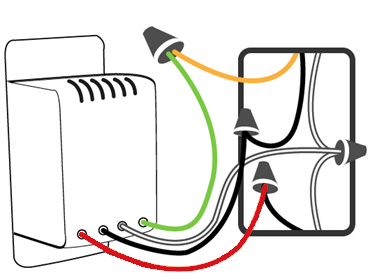 This article shows the correct wiring diagram for the Wemo Dimmer. WARNING: Electrical wirings of the Wemo Dimmer should be done by a professional electrician. Incorrect installation is dangerous or illegal. If you are unable to identify which is a load wire and a line wire, or is unfamiliar or uncomfortable with electrical work, please call a professional electrician. Diagram one: You should see two additional neutral wires connected by a wire nut as well as the line, load and ground wires. 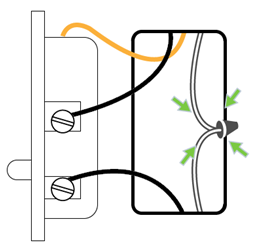 Diagram two: You need neutral wires to install a Wemo Dimmer. Do not try to do it without neutral wires and be careful not to reverse the line and load wires; otherwise, nothing will work. For instructions on how to set up your Wemo Dimmer, click here.